After the huge success of last’s years Garden of England run - the main problem for this year was meeting the expectation of another good run! I don’t think the weather programmes have ever been watched with such intensity or regularity in our household, in fact I cannot remember the forecast changing as many times either. Come the day, it all melted away with the rising Sun - great, looking good, meet up with Dave Mollison and ride into Mottingham checking a few sections of the route at the last minute on the way in. 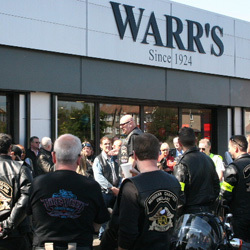 They say the Sun shines on the righteous - well it shone again for us that day and all fears were put to rest - 79 riders booked in, breakfast was sizzling courtesy of Warr’s and the atmosphere buzzing - another stunning turnout - even better than last year. With the Road crew having departed in advance to mark the route out of London, the main group eased away into Chislehurst village past the ‘Queens Head’ and out of London with the Meridian Chapter flag proudly displayed at the front of the ride. Down Farningham Hill and past Brands Hatch picking up some friendly acknowledgement from the Kent Traffic officers on duty with their bikes at the race circuit. The procession eased gently into the Kent countryside - past the Oakdene café and into the lanes, picking up smiley faces and waves from people as we passed through the sleepy villages. After a quick break and talk we pushed off again across the motorway and back to the A20 to continue our gentle cruise through the countryside to Ashford where the pace picked up a shade whilst we joined the motorway for the last leg of our journey. Having left the motorway at junction 11 we filed into the narrow lanes taking us towards Stowting and the Tiger Inn where again Harry and his team worked their socks off to get everyone served. Needless to say we filled the entire remaining car park and spilled over into the lane and adjacent neighbours property, who kindly rushed out to offer their drive for parking. The Pub was bursting at one point - the regulars, having been told by Harry we were coming decided to stay and join in! It was a great day made better by excellent weather - and without doubt the smiley faces of all who turned up and the efforts of the road crew. A big thank you to Dave Mollison (Last Man), Andrew Papas (Roving Marshal) Pete ‘Patch less’ Richardson, Steve Hush, Nick Franklin, Penny Gifford, Lang ‘Lord’ Langley Gifford, Conor McAnally and Paul Wiggins for their hard work at making the day a success. Also John Warr for the breakfast and of course all who turned up - we could not have done it without you.